Located at the intersection of Oliver Street, East Broadway, the Bowery, and Park Row, Kimlau Square stands at the center of Chatham Square. To usher in the Lunar New Year and to commemorate the Year of the Dog, Chinatown Partnership is excited to announce the arrival of a life-size bronze dog sculpture titled "He thought this was going to be a year of good fortune." This 900 pound, 6 foot tall bronze statue, created by reknowned sculpture artists Gillie and Marc, will be placed at Kimlau Square (Chatham Square & East Broadway) for public appreciation and enjoyment as part of NYC Parks' Art in the Parks program. The statue will be unveiled on February 15, 2018 at 12pm, and will be on display through January 2019. In Chinese tradition, when a dog enters a home it symbolizes the coming of good fortune. 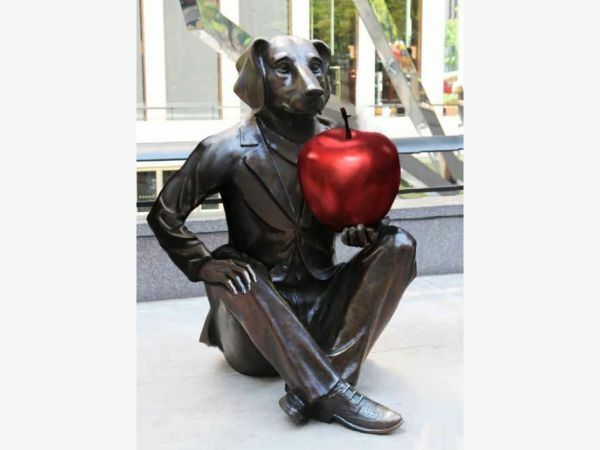 The Good Fortune Dog statue will be holding a beautiful red apple with 3 leaves. The number 3 is a lucky number during the Year of the Dog. The Chinese word for apple is 'ping', which sounds very close to the Chinese word for peace and represents the message of diversity and acceptance for all beings. Photos shared on social media (Facebook, Twitter, Instagram) using the hashtag #GoodFortuneDog will have an opportunity to win a prize from Chinatown Partnership! Posts submitted from 2/15-3/31 will qualify and winners will be notified in early April 2018.